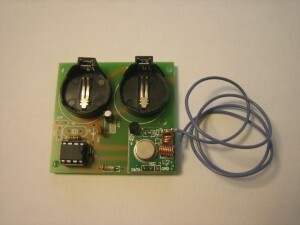 A while back I did a review of some of Ananiah Electronics‘ RFID modules and readers. These are simple RF devices that fulfill the baseline requirement of an RFID device (periodically transmits an identifier)… but the great thing about these modules is the price. You can get them for a steal of a deal, which makes proof of concept applications, prototyping, or just plain home brew projects able to be done on the cheap. The only down side at the time of my original review was the lack of an RSSI value in the reader data stream. An RSSI value is basically a signal strength indicator that tells you how well the reader is receiving a signal from an RFID tag. The upside to that is, many people use value as a poor man’s distance meter. True distance or location can never be surmised using RSSI alone, but using multiple readers placed in key locations around an area you want to monitor can give you a darn close approximation. Well just recently Ananiah Electronics released their new RF9315R reader module that reports 8 bit RSSI data! That means you get a high resolution RSSI value between 0 to 255, depending on how strong the tag’s signal is. This is great because until now I’ve not been able to find an active RFID reader with a decent RSSI data stream for under $40, but these guys have done it. I decided to use the same RF8315T transmitter I used in the last review so I could show the difference in data streams between the classic RF8315R reader and the new RF9315R reader. For the test above I didn’t move the tag at all because I wanted to see what the RSSI variation would be of a stationary tag. I was pleased to see that the RSSI value didn’t change much while everything was sitting still. After picking up the active tag and moving it further away, the RSSI value went down as expected. However the same effect could have been achieved by simply curling the reader antenna under itself or interfering with the signal in any number of ways. Because its easy to interfere with the signal, RSSI values alone can not be used to accurately judge distance from a reader, or location between multiple readers. Even low batteries could be a factor when it comes to RSSI values changing. Even so, the bottom line is; the RF9315R is a great and very affordable active RFID reader. 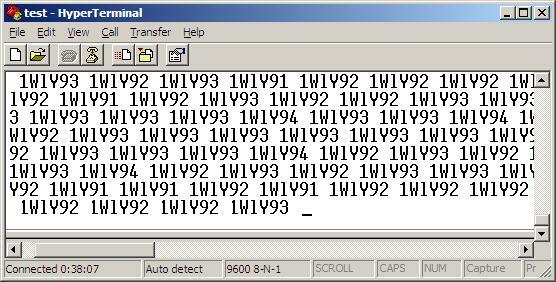 This entry was posted on Wednesday, July 1st, 2009 at 4:20 pm	and is filed under Adventures in RFID. You can follow any responses to this entry through the RSS 2.0 feed. You can leave a response, or trackback from your own site. I was wondering if you by any chance know the conversion for RSSI to dB or dBm for this particular receiver? I’m getting say values of 103 from a distance of 1m away with a 20m transmitter, but I’m wondering what this value converts to. I’ve seen that other manufacturers provide a formula or conversion table, however I haven’t been able to find one for this receiver. Actually I’m not sure to tell you the truth. The website isn’t very clear, and I’ve never had a use for dB as I pretty much calibrate the value range on a per device/project basis to suit my needs. What’s your project? I’m always interested to hear more about people’s projects, especially when RSSI is involved in some way. We are using RSSI as a means of tracking an objects motion. We have 4 receivers placed in the 4 corners of a 20x20ft room. We are attempting to have a person carry a transmitter, and track their location as they move about the space. Using the RSSI value provided by each receiver, we will run it through an RSSI to distance algorithm which will provide us with an x-y coordinate and we would like to plot this coordinate and track the persons movement in a gui of some sort. I realize many factors contribute to RSSI values besides distance, but for our tests we will be removing most of these variables. We have developed the algorithm, however we need the RSSI value to be in dB or dBm’s. Let me know if you have any suggestions. The old battery reading is lower than the new battery reading. If you need to map and create a table for distance you need to have a constant power supply and do a lookup table by yourselves. 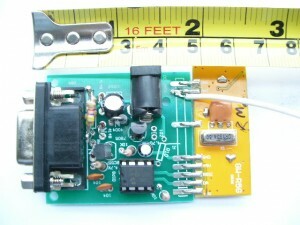 Different type of transmitter using the same battery will have different RSSI value as well. I wonder is there any chance to get the tag’s direction by just adding a directional antenna to this RF9315R reader? Or, would you suggest any active RFID reader that able to provide directional information and RSSI value? I suppose you could use a directional antenna to determine at least a vague notion of direction. In fact, if you mounted multiple antenni pointed in fixed directions and used an antenna multiplexor (similar to solution in Chapter 8 of RFID Toys) to cycle through each antenna, you could create a “direction” data feed on a second COM port from the multiplexor and match up high signal strengths to direction data. I don’t know of any active RFID systems that use multiple antenni to determine direction, but that’s not to say they don’t exist. I think what most solutions tend to do is deploy more receivers and try to determine approximate location, from which a direction bearing for a tag from each receiver can be derived. Thanks for your information.It really helps in giving me a brief idea on how things work. No problem. If you haven’t checked it out already, search around the user forum at http://rfidtoys.net/forum for more info on location and direction finding. You can also post your questions there and I or someone else will try to help you out. Ananiah Electronics has a reader (RF2315R) that they designed specifically to my specifications (it turned out not sufficent for my application) that has dual receivers on the reader. It’s purpose was to apply a directional antenna to each receiver module so you can determine the tag’s location by comparing the RSSI values. However, Enoch is correct when he says that the RSSI values differ from module to module (even if they are both powered by the same power source). Therefore, using this method to determine tag location is far from precise. That’s what I’ve found. 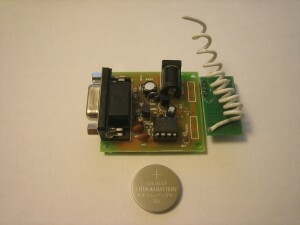 The fact that both the tag and reader modules are hand made and the antenna wires are simple connecting wire means the RSSI values are not calibrated to each other. However you could potentially create a software calibration table for each tag to help level the field a bit. Cumbersome yes, but it would vastly improve triangulation efforts. Actually, I have one of those dual antenna modules. I have yet to hook it up and test it, but it might still prove useful as a “hot zone” style reader where you could determine which zone the tag was in. That, for many applications, is good enough. I am total a amateur in this field, and i am going to did a project about the indoor locating system based one RSSI values. I was looking for the readers capable of providing RSSI and also cheap. so thanks for your review. However, i was wondering that RF9325R is just the receiver module not like other readers that integrate antenna in it? So , If I want to buy RF9325R , then I also need to buy the coresponding transmitter?? And how did the Receiver and Transmitter work together, Can you provide some links and reference book? I am quite confused about using separate Tx and Rx to implement a system. Yes, the RF9325R is just the receiver, or in RFID terminology it is the “reader”. The transmitters, or in RFID terminology “RFID tags”, are separate. Each reader can receive data transmissions from multiple tags, but because you are trying to put together a locating system my bet is that you will need to have multiple readers around the area and maybe only one tag. If you have more questions on location finding using RSSI, search the RFID Toys forum at http://rfidtoys.net/forum – there are a lot of posts there about it, most of which explain why it’s so difficult and unreliable to use RSSI values alone to locate something. I am going to do the locating system based on range-free algorithm. Currently i am interested about the algorithm called LANDMARC. What do you think about it ? it basically deployed lots of reference tag and compare the RSSI from reference tags with the target tags. Did this works out?? since it is just my graduate design and it is just a prototype system developing , So i was wondering whether or not this idea can work out or i should look for other method? Another thing is if i want to use RF9325R to implement my system, then i need to buy several RF9325R(reader) and tags which developed from the Ananiah Electronics?? All I can say about Ananiah products is that they are inexpensive, which makes them great for hobby projects and things like your project. The problem though is that Ananiah products are also inexpensive because they are not engineered to be “commercial grade”. Because everything is manufactured by hand, nothing is calibrated. One tag may read as 200 RSSI while another tag sitting right next to it may read 150. That also applies to readers, so one tag may read one value on one reader, but a different value on another. When you get all of these variables together, using RSSI at all with Ananaiah products for location finding would be next to impossible no matter what algorithm you’re using. You may also look into OpenBeacon (http://blog.amal.net/?p=247). They employ a different strategy for coming up with RSSI values, and some software has already been created to use OpenBeacon to track and illustrate vector paths. It’s not exactly location, but it gives a pretty good representation of object movement through a space. The bottom line is, most RFID systems are not designed for locating anything, so you will have to do a lot of work to find a system that works well for it. i was wondering that if i adopted the RF9315R as the reader, then what kind of tag should i adopt?? i can use only tags from the ananiah electronics??? 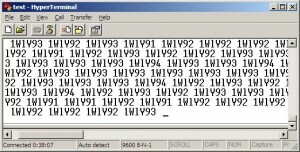 The “tags” and reader are very simple microprocessors attached to a basic transmitter. There is no special air interface or data protocol, it’s simply data packets transmitted in the clear over the air. 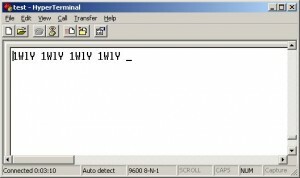 However, unless you plan on building and programming your own tags, then you have to buy Ananiah tags if you are going to use the RF9315R reader. i am planning to do a human following robot with active RFID. I was planning to use RSSI value to determine the distance of reader to tag, then convert it to angle information for my motor controller using mathematical equationst, but i read that the result will be far from precise. is it true? Is there any reader that can provide angle information?i need something that is ready made so that i can mount on the tank kit and interface with arduino. Unfortunately this is true. Even using perfectly calibrated gear, RSSI alone is a very difficult method to use to determine precise locations and angles. That’s why cellular telephone systems use RSSI with another technology like AoA (angle of arrival) or TDOA/TOA (time/distance or arrival) to make more accurate calculations. To make matters worse, most RFID gear is not that finely calibrated. One tag may report an RSSI value of 213 while another tag in the same position may report 241. Interference from obstacles also play a roll in confusing triangulation efforts. Hello, I am doing a research that involves the use of RFID. Precisely, i need a reader that can also write to tags. And one that will enable me calculate the distance between each tag and the reader. Does anyone have any idea? Check out OpenBeacon. It is an active RF platform you can write your own firmware for. That might be a good place to start. 2. determine its distance from a fixed reader. I need this for a construction research application. Pls reply. You can do whatever you want with OpenBeacon as long as you adapt the firmware for your purposes, but even the most robust microproc’s memory bits will have a limited write-cycle count before they start to break down. What do you mean by “continuously”, and more importantly, why do you have to write data to the tags? Determining distance is not that easy. Distance can be guessed at using signal strength, but it’s not a true means of determining distance like other range-finding technologies. Do you only need to determine distance, or do you also need to determine direction? You might want to post your project requirements to the RFID Toys forum; http://rfidtoys.net/forum where we can continue our discourse in thread fashion. Thanks Amal, i post the reply and hat i am working on under “general news and info”. I will be expecting your reply.